← Well, it’s been a nice summer. It was like the queen coming to tea, or somewhat more relevant to this generation, like New Direction visiting all girls school. There was cheering, wild waving and gap-toothed grins. Unbelievably, Mommy had entered the pool. It was 90 degrees on July 4th, and we were pool squatting at a friend’s, meaning, they were on vacation and we were, uh, making sure the pool was okay. It was just us and their oasis of a yard. My kids quickly jumped in and started thrashing around like just caught fish on the deck of boat, except in water. My husband also joined the party. In fact, he might have been the first fish in. With the kids engaged and a parent on duty tossing them around the water, uh, supervising, I was free to read my book and relax. To the sounds of splashing and giddy laughter, I positioned myself on my friend’s comfy outdoor couch and opened my Kindle. I was reading Me Before You. It was turning out to be the kind of book where in every spare moment, I hungrily and guilty sneak in a few finger page flips, like when I’m pretending to make lunches for the kids, or those brief minutes between giving the kids some water guns and someone crying. Now it seemed I had a good, relaxed hour of just me and my book, without feeling like an adulterer whose husband was about to walk in. Bliss. Even though he wasn’t speaking to me, I glanced over at the pool in time to see his skinny, white body clutch his knees and cannonball. “Me too! I can too!” I heard my five year-old squeal. I tried to ignore them, but I couldn’t concentrate. No one expected me to participate. They knew Mommy didn’t like water or swimming, since Mommy definitely shouldn’t have seen Jaws at 5 years-old, and possibly had drowned in a prior life. No one was bothering me at all. But I was bothered. I placed my Kindle on the cushion. I was sitting in a pool of my own sweat anyway. Slowly I made my way toward the pool and tentatively put a foot in the water. On doggie paddles and floats, they waded over to me. I was barely in, my anxiety rising with the water around me, deepening with each submerged step. I was in over my head, and I was only up to my knees. They swarmed me, laughing, splashing, pulling me further in, jumping on me. They were circling sharks and I was fresh meat. It was kind of a blissful torture. I was so happy to be in there with them, to take part in a family moment and memory. But if they’re expecting a repeat performance anytime soon, they shouldn’t hold their breath. Posted in Every Day Scoops and tagged afraid of Jaws, i don't like the pool, i hate swimming, jumpinginto a pool, Me Before You, swimming with the sharks, Yeah write. Bookmark the permalink. Loved this! I only have one and being attacked in the water by her gives me anxiety sometimes too. Good for you for enjoying the moment. right?? it’s so… in your face. like the dentist! haha! Oh I”m so glad you got in. I am terrified of water too and can feel your pain on this. And “blissful torture” sums up parenting and really all of life for me. GREAT POST. Oh, love, I could have written every word of this post. I hate getting in the water, but once I do, as infrequently as it is, I’m always happy I joined in. 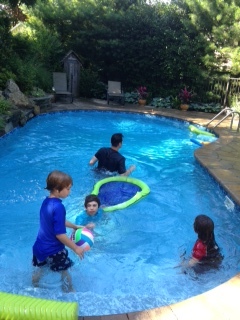 I hate that my kids know me as the mom who won’t get in the water, but hey, when I do, it’s a party. Great post! A journey of a thousand miles begin with a single step. This single step may not lead to a thousand mile journey but in its own way it is even more important. Good for you for facing your fears even if you can’t do it again. thanks. i appreciate it. some things are just innately hard, right, for no apparent reason. I love being in the water, but actually hate just getting in. Strange. 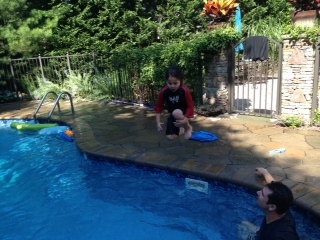 Hurray for getting in the water, if only briefly and under duress, so you could share that time with your boys. Don’t torture yourself with a slow entry next time. Just jump in. Good for you! It must have felt great in the heat. I grew up with a pool and have many happy family memories of playing games as a family. Now Janet loves swimming, but it is tortuous watching her enter the water…one little toe at a time! i’m so glad you’ve got good ole flat to keep you company until they return. he’s good for a beer and give you his ear. Good for a beer, you’re kiddin’ me, talk about a pub with no beer, he’s drunk the place dry. Strewth, don’t tell the kids! Way to go! It’s good to surprise the family every now and then- keeps them on their toes. Thanks for the laughs too! Ugh, I hate getting in the pool just because my kids hang on me as soon as I do! It would be so nice if I could just float around. But that sweat thing gets me too. Glad you took the leap. It’s good to get out of your comfort zone once in a while. I think my family’s hearts would stop beating for a moment if they saw me walking into the pool! I am much happier on the sidelines with a drink. Despite the constant ribbing I get about it from my extended family. On July 4th I actually sat at the edge of the pool with my pants rolled up to the knees and dangled my feet in the pool. It was just that hot! And that’s as far as I’ll ever venture into the pool. Good for you for taking the plunge! it was like that – mouths agape! so funny. wow, youre really brave. I am terrified of water….you said it perfectly with the in over your head while up to your waist….its stifling…congrats. i was so happy when i was out swimming in my own sweat! I always end up being intimidated by the coldness of the water. Go you! Glad you got in. I’m usually the one who dips a toe at a time and slowly slinks in the water shivering the whole time. I’ve never been a jump in the pool kind of person. And I love your description of stealing away moments to read. Those uninterrupted moments become so precious post-children! Loved this post! Oh, I love this! This is one of those stories that could be repeated at family gatherings for years to come. Unless, of course, you jump in again next week. My mom always dipped her feet in the water and then headed back to her chair. For years I thought all Moms couldn’t swim. no way – i’m going to let this be the big moment in their brain. I was born a fish, but my mother never, ever went in the water. She had a near-drowning experience in high school, so she made sure we all learned. I would have been just as shocked and delighted as your kids to see her wade in. They will always remember that you did! i think you’re just born water loving. i know how to swim but i just hate it. still, every once in awhile it’s nice to see their happy surprise. It’s been so hot here in Southern California lately that all I can do is look at that photo of the pool with envy. WANT. i did! and they were merciless!! i hope so.. for a loong time – so i don’t have to do it again!